The Intellicone® Safelane real time incursion warning system is celebrating its second anniversary this month. 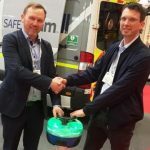 Since its launch it has been used on over 4,000 sites demonstrating significant safety and efficiency benefits to contractors & highway authorities across the UK and internationally. 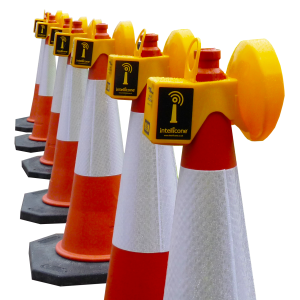 The value of such a real time warning system has now been formally recognised and underlined by Highways England in their latest (July 2016) Raising the Bar document (Managing Temporary Traffic Management Incursions). 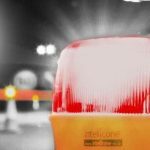 Primarily designed to instantly warn the workforce of a temporary traffic management breach regardless of location and distance, the system has also demonstrated that it is possible to deploy fewer traffic management operatives (TMO) whilst enhancing safety. The latter has resulted in significant net cost savings on some road closures. Not only is this a major financial benefit, it also takes TMOs out of harm’s way, the primary objective. The safety benefits are profound with one Site Supervisor claiming it almost certainly prevented serious harm to his workforce during a dangerous errant vehicle incursion on the A14 in November 2015. 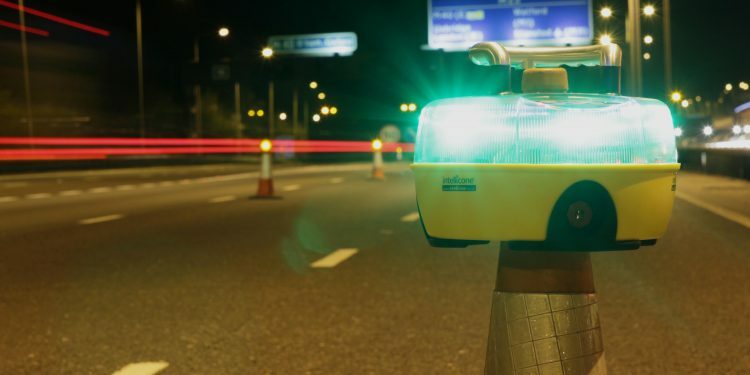 A Traffic Management Foreman on the M25 J30 A13 Widening Project claims it is life saving technology and has helped safeguard workers inside the closure on multiple occasions, “Safelane has proved its worth on two separate occasions now, without it who knows what would have happened with regards to injuries or even fatalities”. To put this in perspective, on this particular scheme there were over 40 cases where motorists deliberately ignored road closure signs in 2015 alone. Safelane is easy to deploy and comes with Wearable Panic Alarms for TMOs manning works access points alongside an integrated incident triggered camera. If an errant vehicle were to forcefully enter the site or even by mistake, the TMOs are able to alert the workforce instantly with the simple press of a button regardless of distance whilst incident footage is recorded. 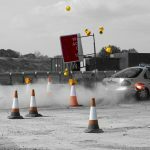 Despite best efforts in reducing the risk of incursions to an absolute minimum it is impossible to completely eliminate the risk of an errant vehicle entering a temporary worksite. Enabling TMOs to instantly alert the workforce is therefore a major safety enhancement and important tool. 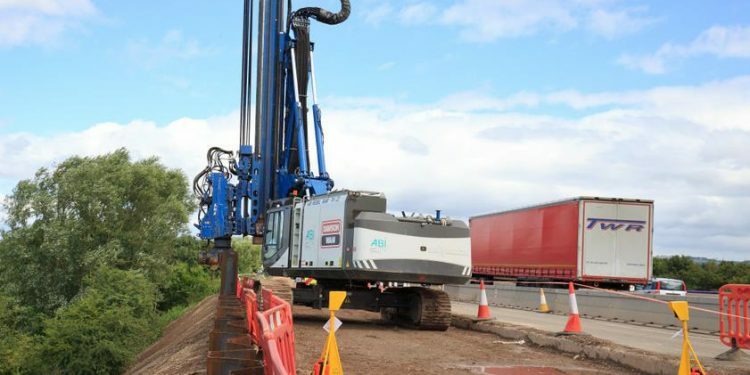 Dawson Wam was awarded the contract for the installation of permanent sheet piled retaining walls and king post walls for the M5 J4a-6 Smart Motorway project. Piles are generally installed to significant depths into mudstone, and into sandstones in the northern quarter of the site. To ensure the site was kept safe, Dawson Wam used Highway Resource Solutions “Dual Sentry Beams”. The Dual Sentry Beams were adopted as part of a quest for a continual improvements. The beams were trialled on the project alongside conventional systems . 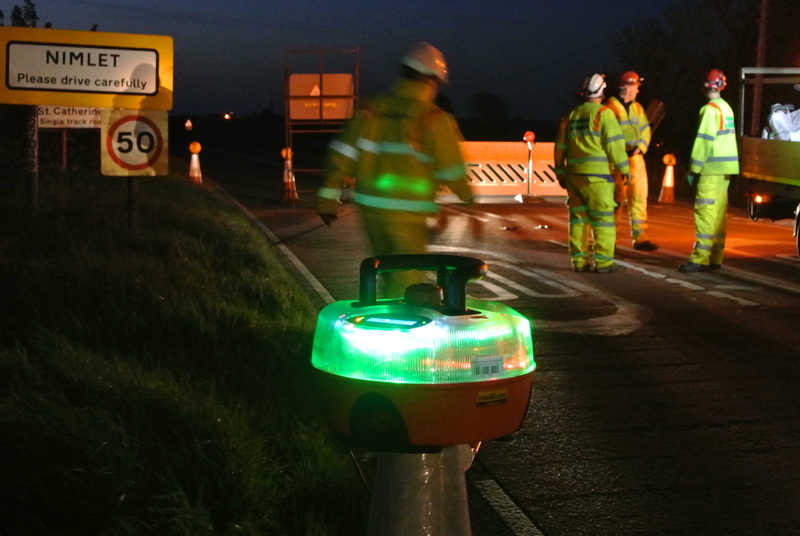 Having been designed to work in a similar method to the Portable Site Alarm, when the beam is broken, the alarm on the Dual Sentry is activated which alerts operatives of a workzone breach. As the Dual Sentry beam is so loud, it is ideal for operatives working in on-site heavy machinery, such as cranes and piling rigs.